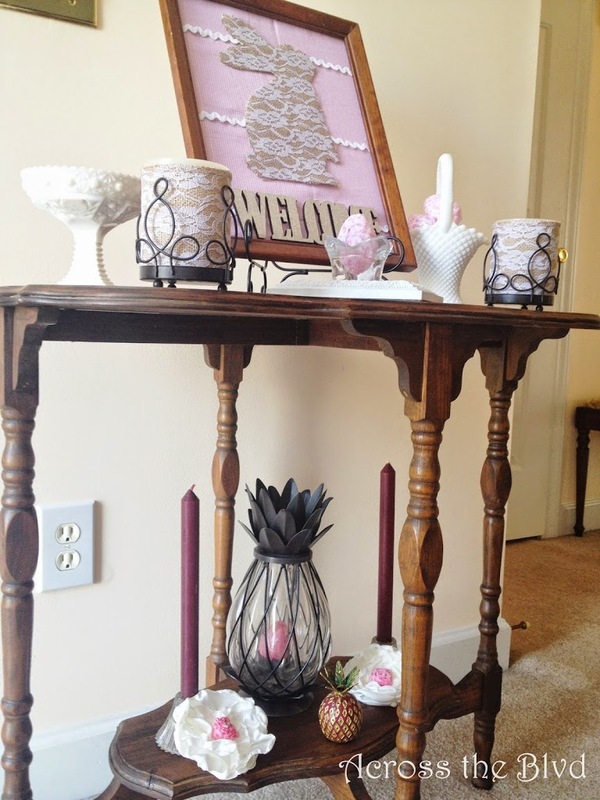 My foyer table is a spot in my house that I love changing out seasonally. 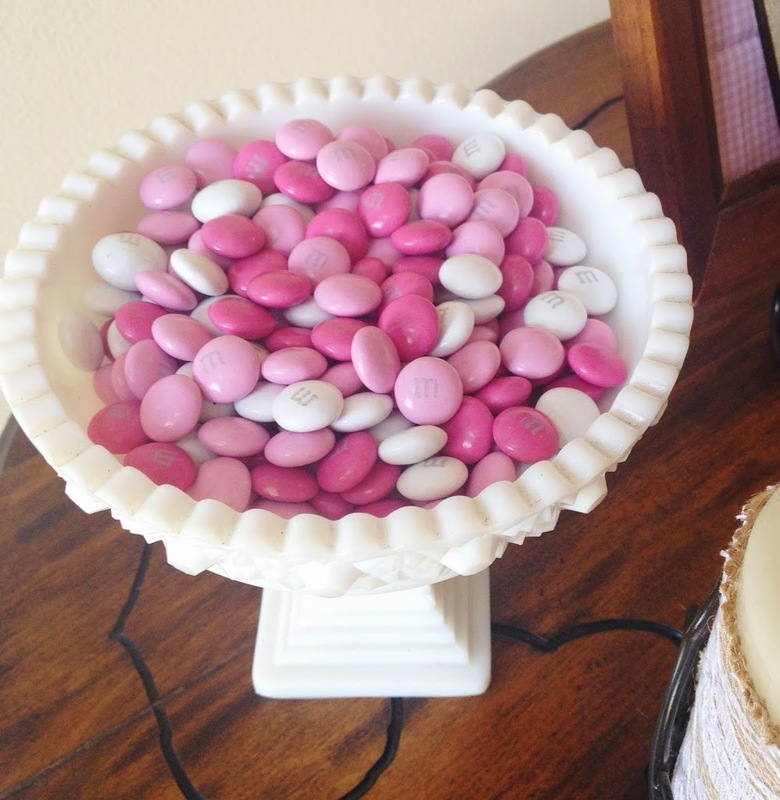 This year, I wanted to use pink and white decor to match my dining room Easter tablescape. I loved that to put the look together, I managed to shop my own house to find lots of pieces that would work for this. The one thing I was missing was a focal point or centerpiece. 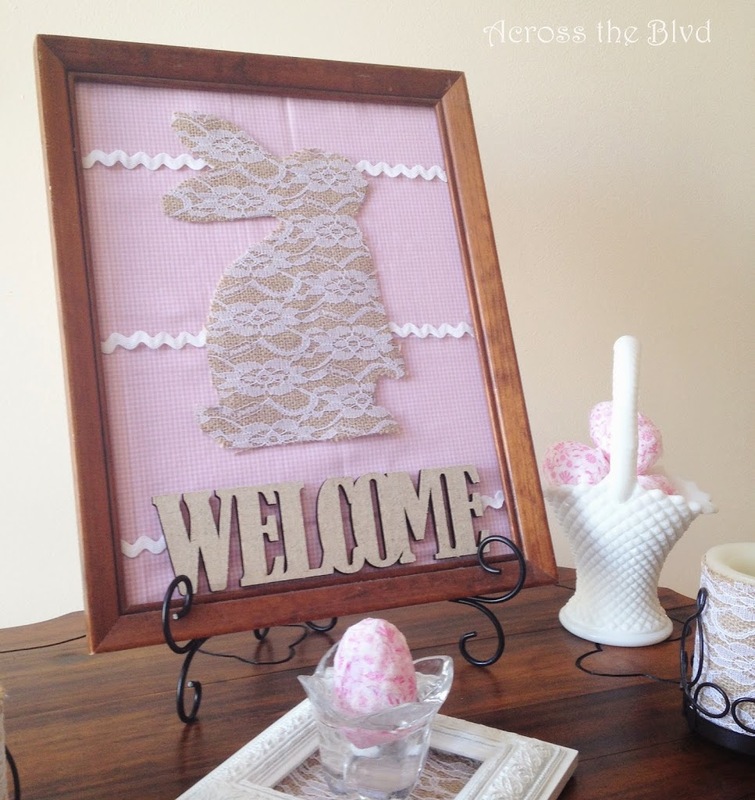 After spotting some lace covered burlap recently, I knew it would make a fun Easter bunny that would be great for this. This is the first craft we’ll be sharing on this series of the Spring Craft Blog Hop which we’re happy to continue to co-host. This round of the blog hop will be featuring Easter, Earth Day, Mother’s Day, Teacher’s Day, May Day, Cinco de Mayo and any general spring time craft. With such a variety to choose from, we know we’ll be seeing some amazing crafts! 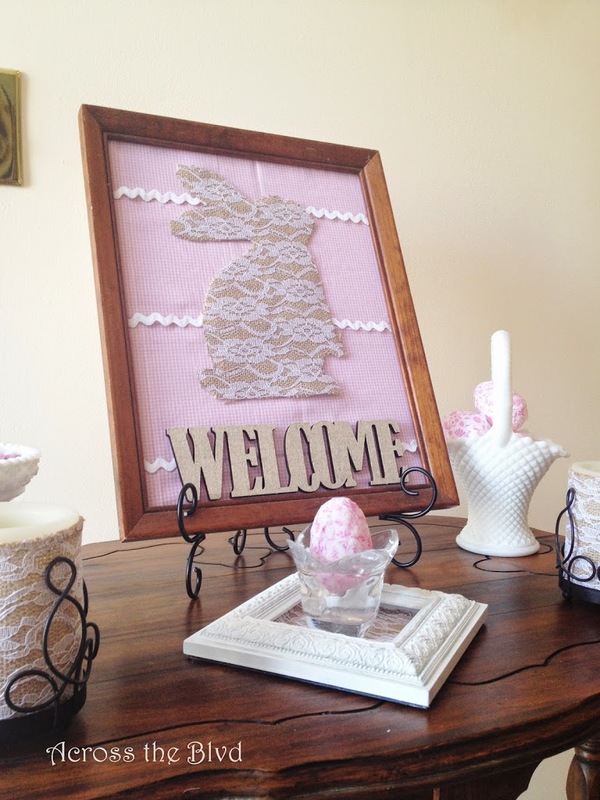 To make this bunny display, I needed a template and I had just the right one. 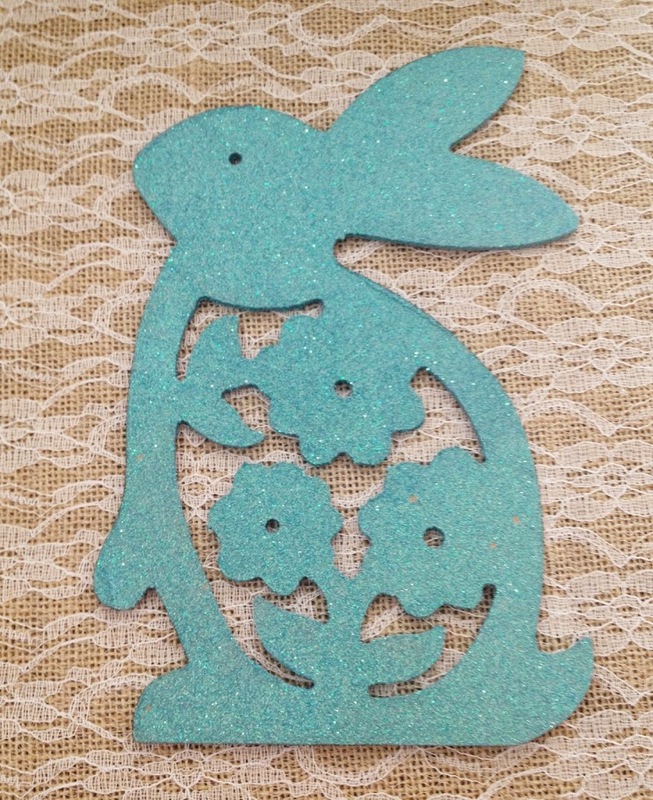 Dollar Tree has these pretty glittery bunnies this season and while I’ll be using him for another project, he worked great as a template. I traced his shape on the lace covered burlap that I found at Walmart a few weeks ago. 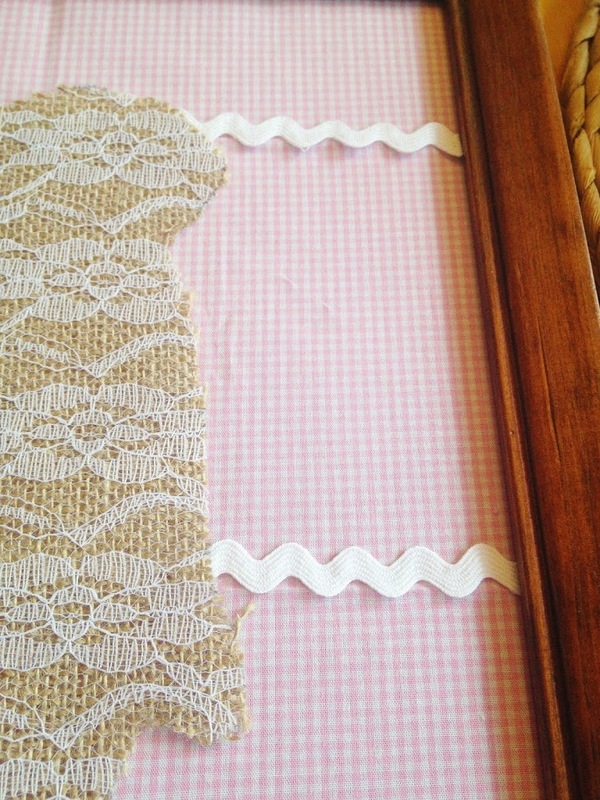 I covered the cardboard backing of an old frame with pink gingham from a single cut fat quarter and glued it to the back. I added more card stock on the back to cover it. Then, I added some white rick rack to go behind the bunny. In addition to adding more layers, it also hides the wrinkles from the folds in the fabric! I hate ironing, even just a little piece like this! 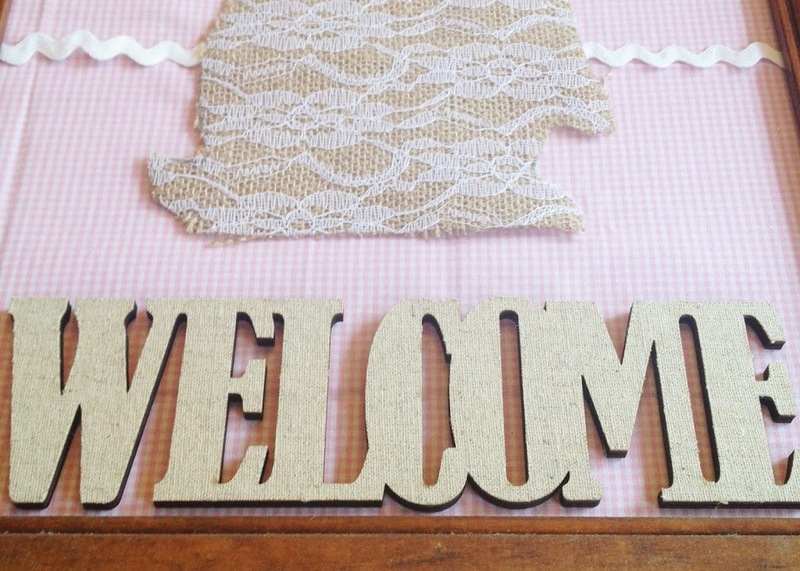 I found this burlap covered Welcome plaque in the dollar bin at Michael’s. It’s hot glued on top of the cloth. Once the bunny was hot glued in placed, I was ready to set up my Easter vignette. 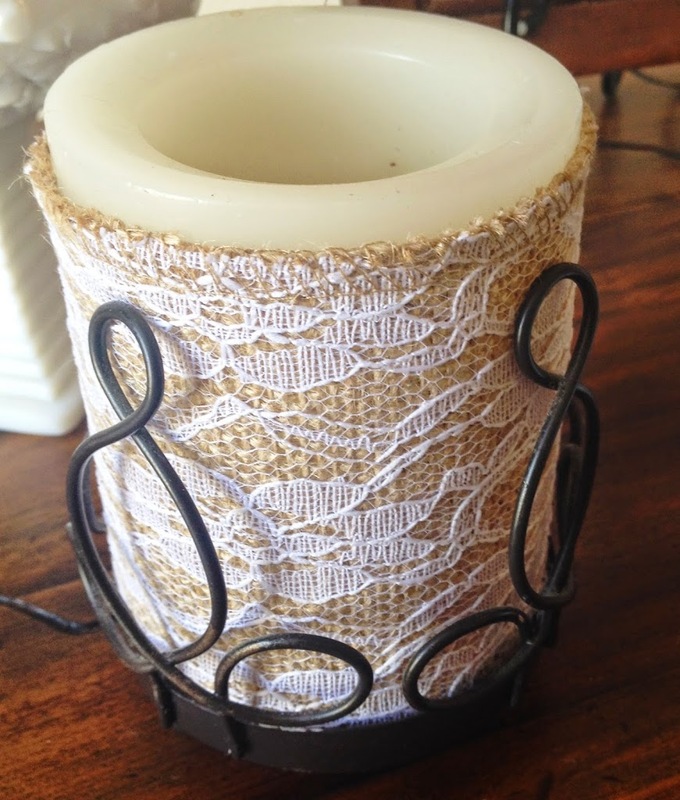 Using the lace covered burlap, I made candle wraps for two flameless candles and placed them into metal candle holders. 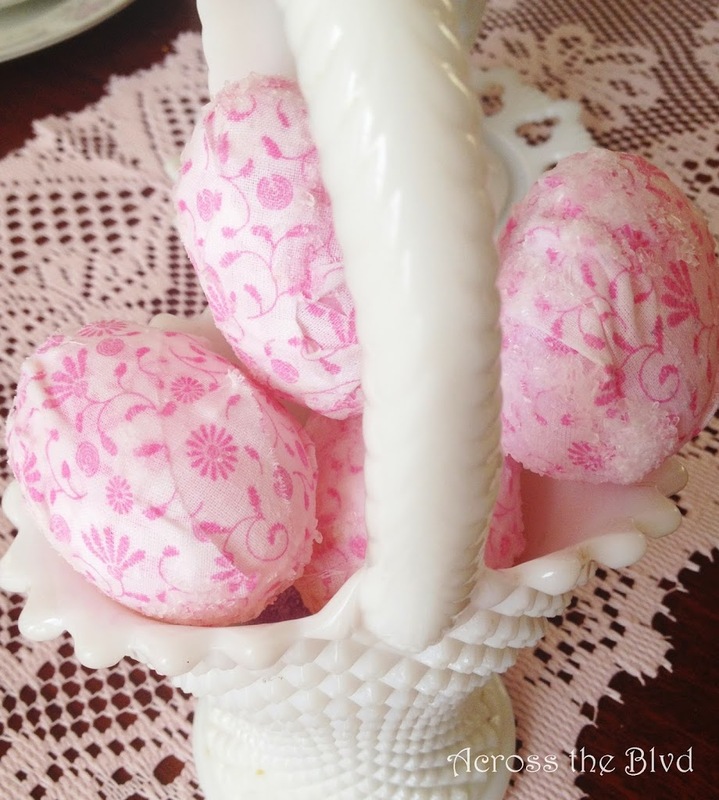 I’m using some of the fabric covered eggs I made in a milk glass basket. 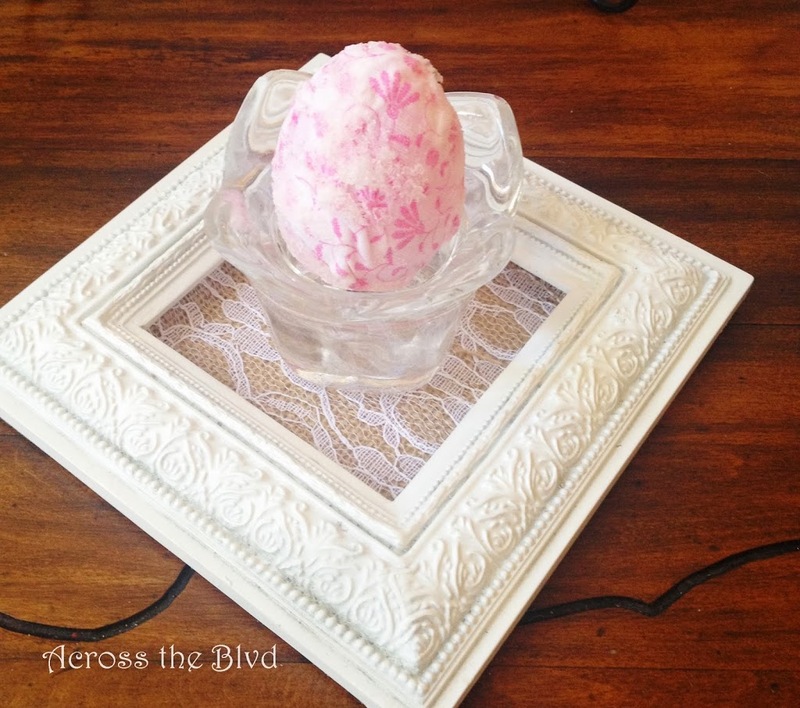 I painted a thrift store frame white and added some of the lace covered burlap to the center, then I added a glass candle holder and one of the eggs. It’s always a good idea to include a little candy. For the bottom shelf of the foyer table, I switched out the candle and replaced it with an egg in my Welcome Pineapple and added a couple of candles and some of my silk flowers. 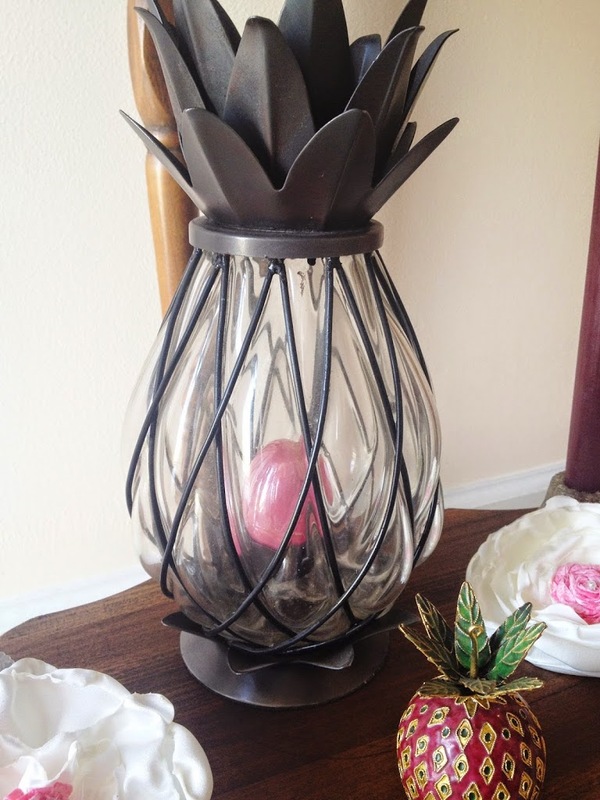 It all came together in a pretty Easter vignette and since I used lots of items I already had, it cost very little. For me, the key to putting together a seasonal vignette is to first choose a color palette and then have a look around my house and find things that will fit. From there, it’s just adding in a few crafty pieces to make it complete. I like to keep it simple and not let it get too cluttered looking. Like most of my decor, I can’t let go of symmetry for this vignette. Maybe one day, I’ll try something asymmetrical, but today is not that day! Is it looking like Easter around your home yet? I hope you see something here that might give you some ideas! Beverly – This looks so beautiful. Love all the pieces you used to tie it all together. 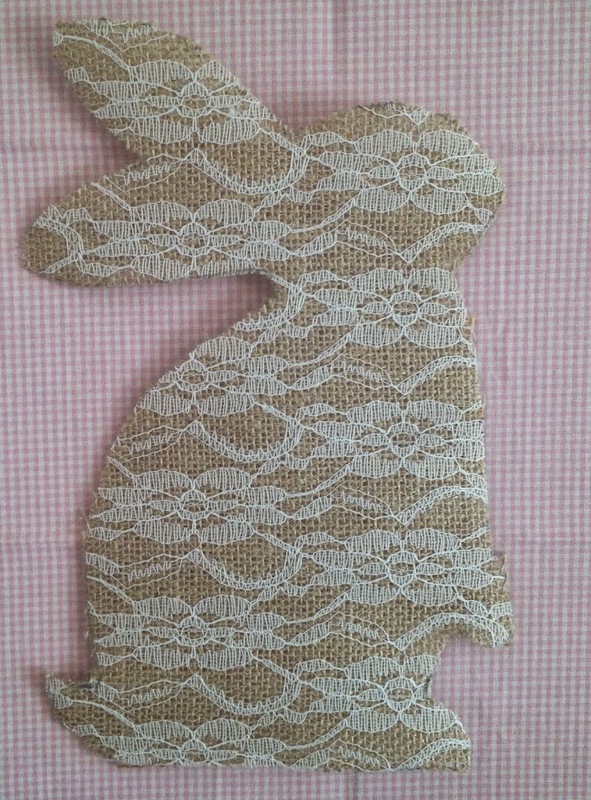 The burlap and lace bunny is my favorite!! Hope you are feeling better! Thank you, Laurie! Glad you like it! I’m better, thanks. My face is still pretty sore though and the stitches are irritating! Thanks so much, Christie! I’m happy to be co-hosting with you again, too. It’s a great blog hop to be a part of. I love just about anything done in burlap! Thanks,Erlene! Hi Theresa, thank you. Great to be co-hosting with you. I love that lace covered burlap ribbon! It really ties everything together 🙂 It’s great to be co-hosting the Spring Craft Blog Hop with you! I loved it when I saw it, too. I’ve got lots of plans for it! Glad to be co-hosting again with you, too. Your vignette is stunning! Full of so much inspiration…love what you did with the lace burlap. Thank you so much, Lori Leigh. I’m happy to have provided some inspiration! That just made my day! Thanks for visiting! Thanks for joining us again on Idea Box!! Congrats on being featured last week, too! Thank you! I love decorating seasonally.Happy to link up on Idea Box. Thank you, I was delighted to have been featured! Thanks for visiting! Thank you, Dee. Pink and Easter go together to me! This is gorgeous! I love burlap and lace. Thanks for sharing with us at Funtastic Friday. Hope to see you again this week. Thanks so much, Sherry. I’m happy to share on Funtastic Friday. Thanks for visiting!